This Vacmaster Professional & reg; Beast Series & trade; 12-Gallon 5.5 Peak HP wet/dry vac is a powerful high-performance vac designed to tackle the toughest cleanup projects the jobsite, around the shop, or in the garage. On-board hose, accessory, and power cord storage eliminates unneeded hassle and minimizes total storage space. A unique Flat power head design allows you to conveniently store tools on top of the vacuum so they are easily accessible when needed. Over 27 ft. Of cleaning reach (7 hose and 20 power cord) allows you to reach farther without unplugging the unit. Quickly control the power with the large dust sealed on/off switch. Heavy duty 360° swivel casters improve mobility on most surfaces. It also includes 9 accessories for nearly any task: 7 ft. X 2-1/2 in. Kink resistant premium hose, utility nozzle, crevice tool, (2) extension wands, floor nozzle with squeegee & brush, fine dust cartridge filter, foam wet filter, and air & noise diffuser. 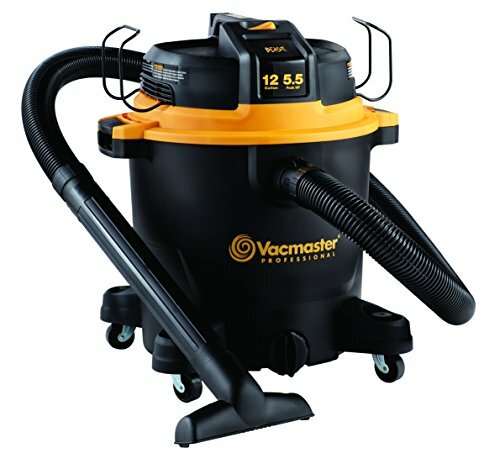 If you have any questions about this product by Vacmaster, contact us by completing and submitting the form below. If you are looking for a specif part number, please include it with your message.